I ventured into using waxed canvas recently. I've seen various bags on Instagram made with waxed canvas and have been meaning to try it out. In fact I purchased a swatch kit about two years ago from an Etsy shop, and it's taken me this long to finally commit and try it out. The main project that started all of this was a new camera bag. I wanted a purse-like camera bag that wasn't obviously a camera bag. I wanted it just big enough to hold my camera and perhaps one additional lens. I opted to buy an insert from Amazon that would be transferable between purses, but I also wanted one tailored more toward ease of carrying. A messenger bag is perfect. 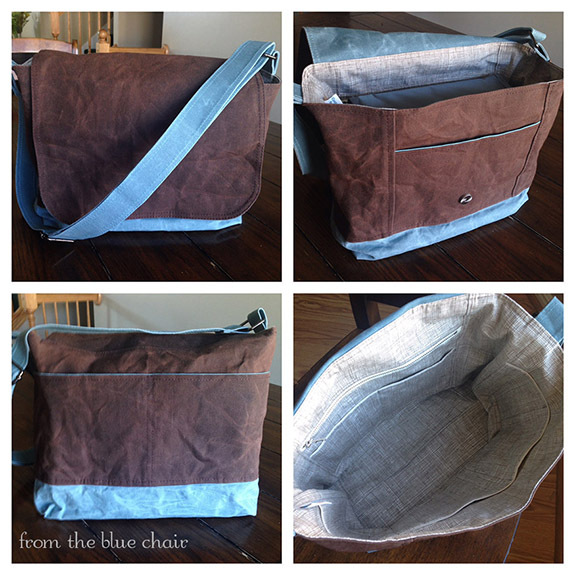 I started with my old Messenger Bag Tutorial from a few years back. I changed it up quite a bit as I wanted a contrasting base and wanted to change up the exterior pockets. I was no longer in love with how I designed them initially. I made them higher than in the original design. Rather than adding piping, I simply rolled the lining to lay slightly higher than the exterior fabric before top-stitching. It saved so much time, but still has the appearance and contrast detail of piping. The more you work with the waxed canvas, the more distressed it looks. This was exactly what I was going for with this bag. The one thing I regret with this bag was the pockets. 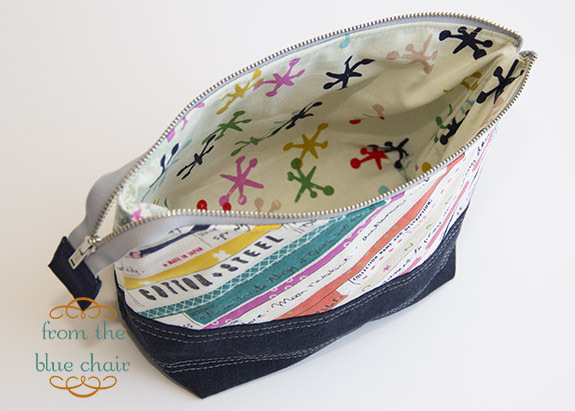 Because I made this bag with the intent of using the camera insert, I skimped a bit on pockets. I also didn't include a zipper pocket. I changed that on the next two bags I've made using this same design. Here it is with the camera insert. 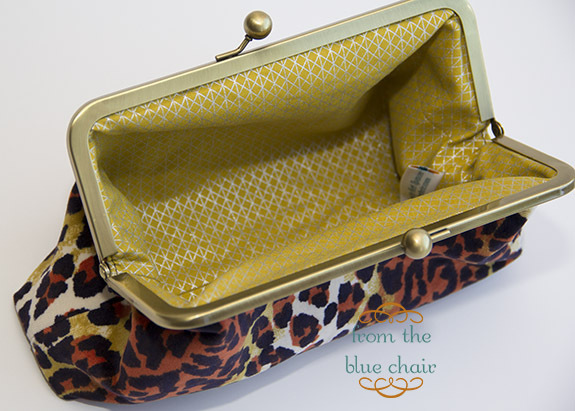 It slips in easily with a few extra inches on the side for my wallet and other necessities. 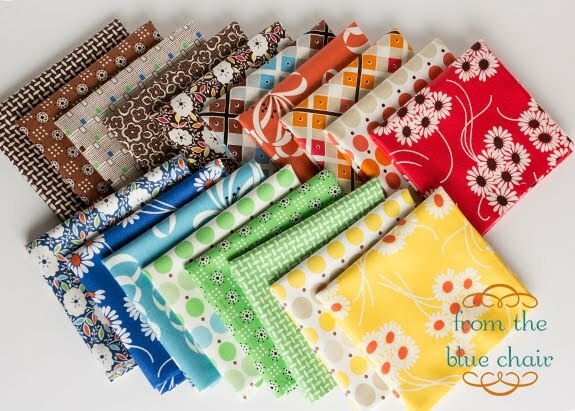 When I placed my fabric order for my first bag, I didn't plan well on how much fabric I needed and ordered too much. 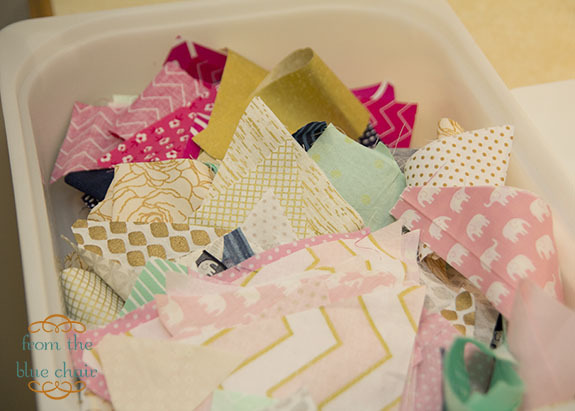 What's a girl to do with too much fabric...well, make another bag of course! This bag is essentially just a very large pouch with handles. I used similar dimensions to a Trader Joes bag, but with a zipper across the top. I also tried leather handles with rivets for the first time. I love, love, love the look of leather handles! I opted not to put any pockets on this bag. It's meant to be a simple tote to keep in the car for library runs, or a small trip to the store. And then I received another custom order. I think this one is my favorite of the three! A few weeks ago I wanted to start something new. I pulled out piles of fabric, put my design wall back up and started experimenting. 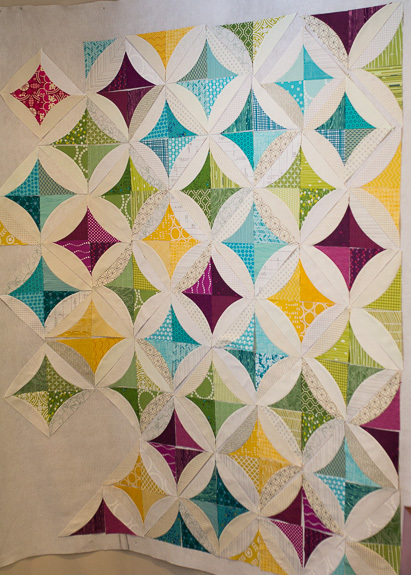 I came up with this block which is similar to a geometric design I saw elsewhere. I used the Quick Curve Ruler to design and cut these blocks. I'm undecided as to how big it will be or if I'll incorporate any additional colors . We'll see where it goes! 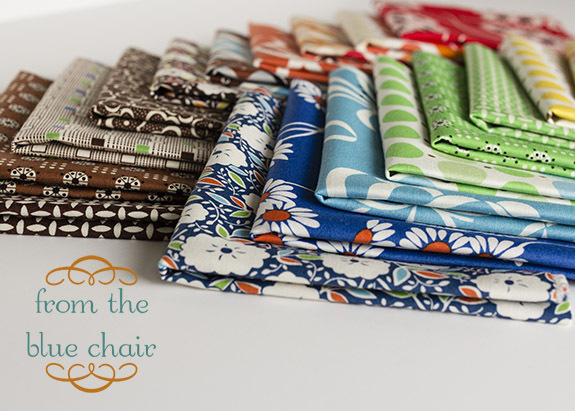 Is there one particular line of fabric that you have always adored? For me it was Katie Jump Rope. 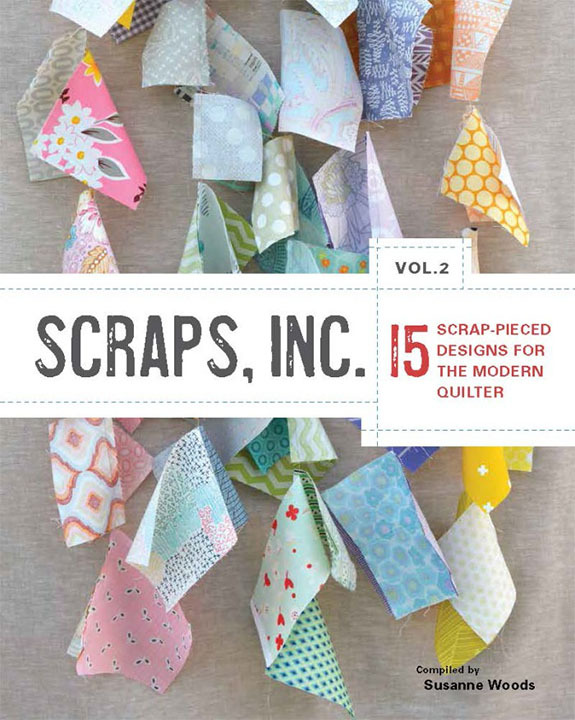 Unfortunately, it came out about a year before I started quilting. I was able to get my hands a few prints before it was entirely gone, but I have never been willing to pay the exorbitant mark ups. I would use the few pieces I have sparingly, scattered through various projects, but always horded them a bit. When it was announced that there were be a Katie Jump Rope reprint, I was instantly on board. Although, when I actually had the chance to buy it I wasn't sure I was still in love with it. Do you ever have that experience--you desperately want something until you can have it, and then you aren't so sure? Considering I haven't been sewing nearly as much lately, I really thought this purchase through. Do I really want it? I asked myself this question so many times. 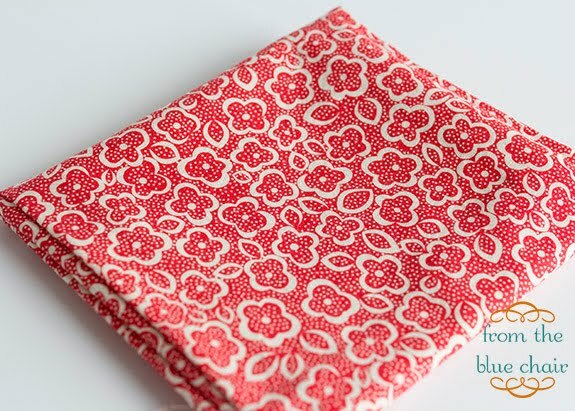 I have tried to be much less frivolous with my fabric purchases--only buying something if I have a specific need for a project. When Pink Castle Fabrics had 20% everything the weekend after Thanksgiving, I decided to splurge. I've liked this line for eight years and have loved pretty much every project I've ever seen made with it. It arrived today! It's really pretty. I'm glad I splurged. The only thing I'm sad about is the fact that they took away some of the really great colored prints prints. I think the reprint is a bit too heavy on the brown. I intended to make a quilt with only the KJR prints, but I'll likely incorporate some other DS prints into the mix to add more color. I feel like it especially needs more red and orange. 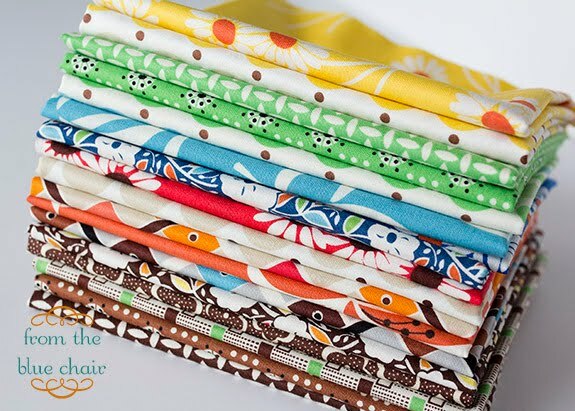 I still have about a FQ of this print from the original line which will certainly work it's way into my quilt. This was one of my absolute favorite red prints ever. I'm sad this one didn't make the cut for the reprint. I've missed sewing, and it's fun to be back with a project! 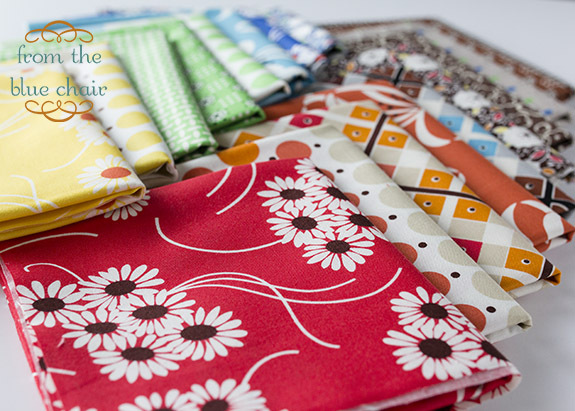 I've decided to make this lovely stack of fabrics into a quilt using the Shimmer pattern by Cluck Cluck Sew. I think it will be the perfect compliment for these prints! 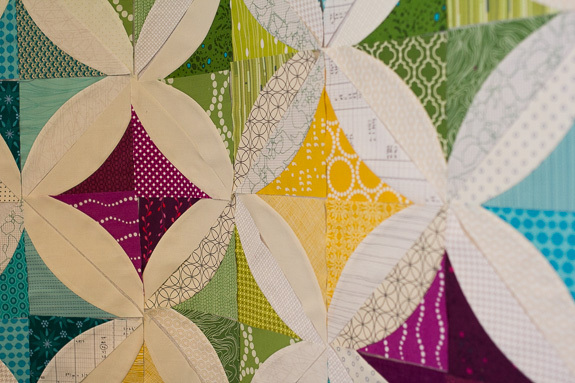 Every once in a while I crave the precision of paper piecing. It's fun to work on a project like this (at least for a little while). I felt this way a while back and started a new project. I had a bin full of scraps from a previous project that needed used. I opted for a pattern that has been floating around Instagram a bit. 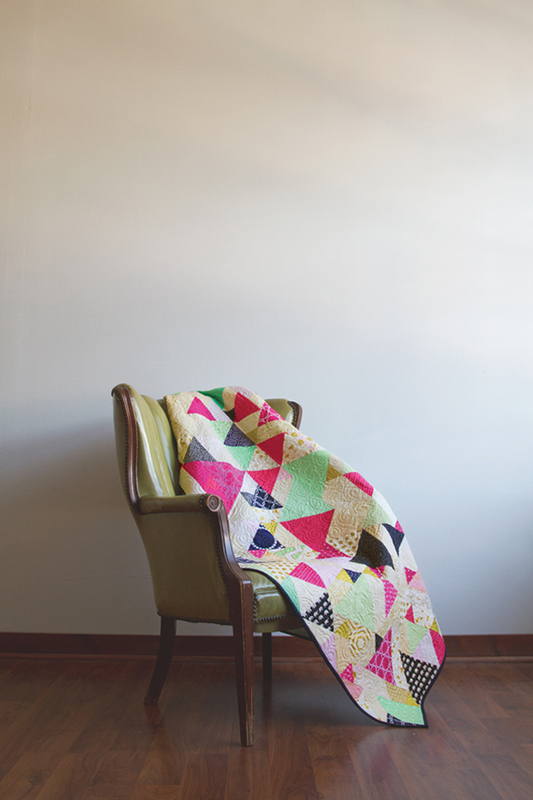 This is a variation on Grandma's Surprise from Then and Now Quilts by Joyce Giezler. This little guy is just 18" finished. I recently completed the quilting and am currently considering a binding. I'll likely go with navy to frame it. 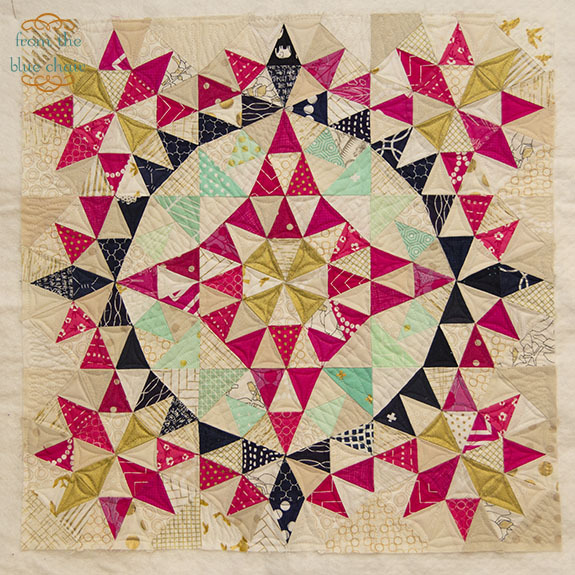 Mini quilts are a great way to try out a new technique or get something out of your system. 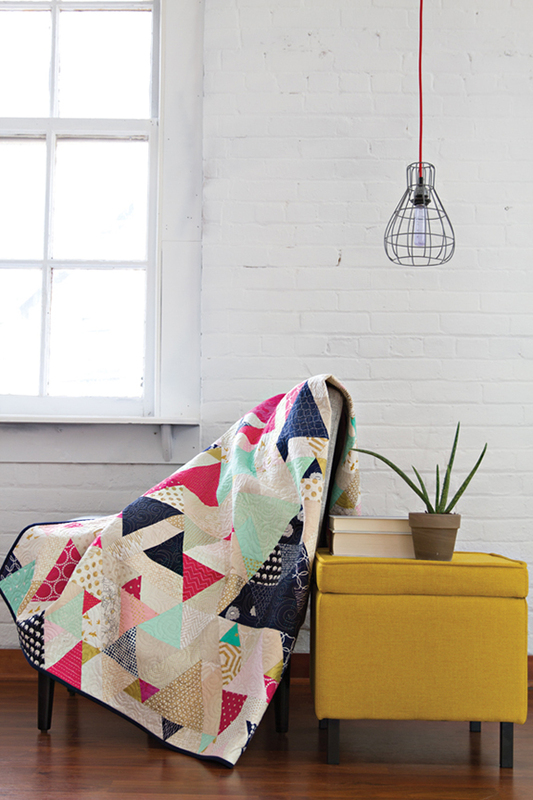 I personally wouldn't ever want to paper piece an entire quilt, but I love it for small projects. 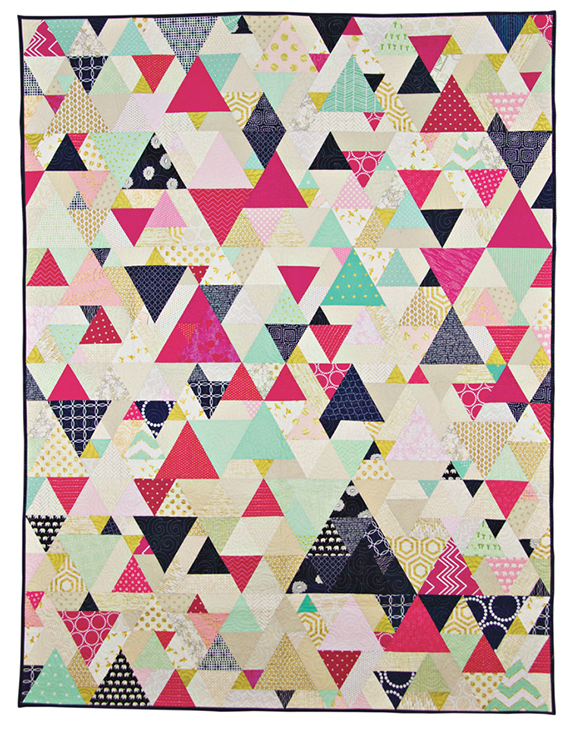 It would never finish a whole paper-pieced quilt. This mini alone took me a couple months to actually complete. Now that I've done a little paper piecing, I'm ready to get back into a project that's more satisfying for me and a little less rigid. 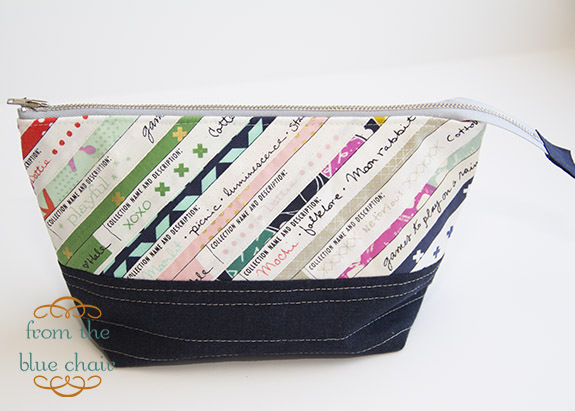 Just a few new pouches! 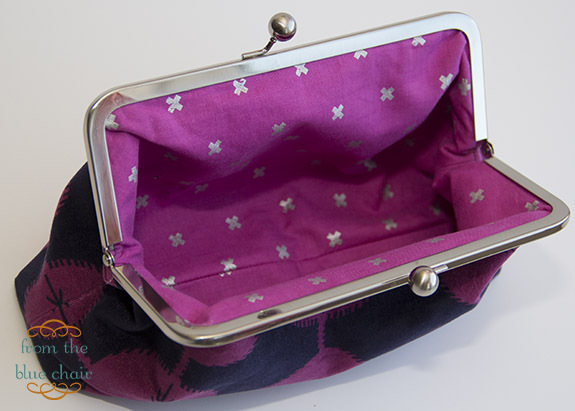 I made these framed clutches using Diane Stanley's (random thoughts...do or di) pattern. I went a little light on the interfacing. Next time I'll certainly use something with more body. 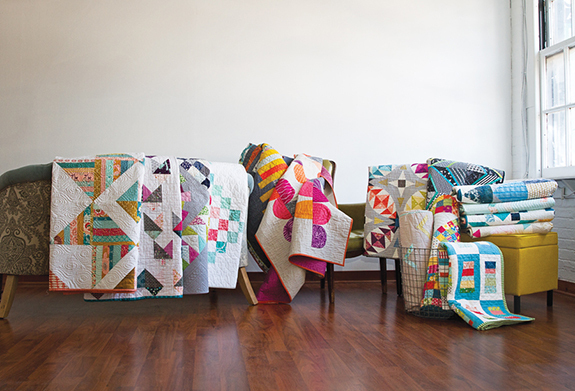 These are both made with velveteen from Anna Maria Horner. 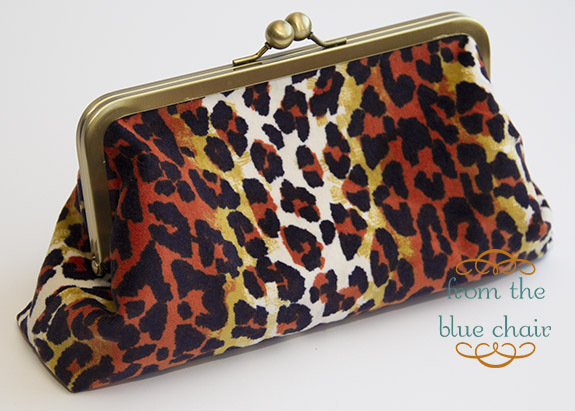 It is perfect for these clutches. I've been itching to use some of my selvages I've been saving for years. 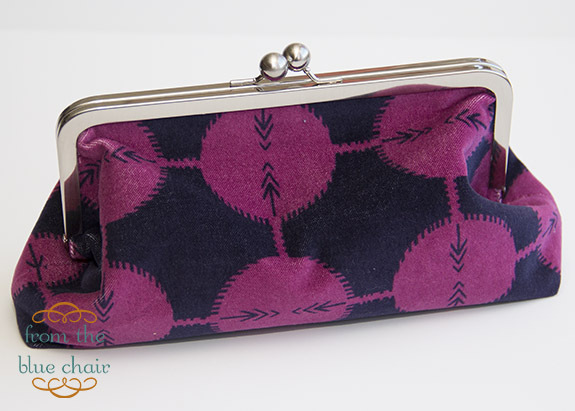 I finally pulled out some of my Cotton & Steel pieces and made this wide open pouch. I sewed the selvages to cotton duck. 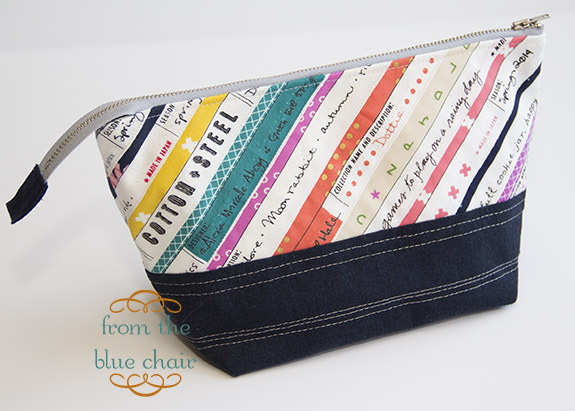 The base is navy linen with some metallic accent stitching. It goes perfectly with my new Super Tote!